There are no error messages - the API proxy call actually returns a success response, such as an HTTP 200. However, the trace window in the Edge UI displays an HTTP 304 response and no trace data is collected. In Edge for the Private Cloud, the Edge UI is attempting to trace an API proxy accessed by a private IP address. 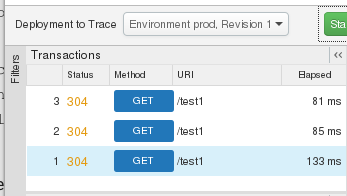 The trace tool in the Edge UI has the ability to send API request to any URL. In a deployment scenario where the Edge UI is co-hosted with other internal services, a malicious user might misuse the trace tool to make requests to services through a private IP address, such as localhost or 127.0.0.1. In a production environment, you typically leave the default as is to prevent users from being able to trace a private IP address. For example, that is how the public version of the Edge UI is deployed. However, for an internal development or testing environment, you can override this default to allow your API developers to trace any IP address. Typically, a development/testing environment is behind a firewall that does not allow public access. Note: As a best practice, you should leave the default as is to prevent trace access to private IP addresses, even in a development/testing environment, unless you run into a situation where you have to enable it. In the trace window for this call, you see an HTTP 304 response even if the curl command returned success. The Edge UI can now access private IP addresses in the trace tool. To later disable the UI from tracing requests through private IP addresses, edit ui.properties to set the property to false and then restart the Edge UI. For more, see Allowing the Edge UI Access to Local IP Addresses.